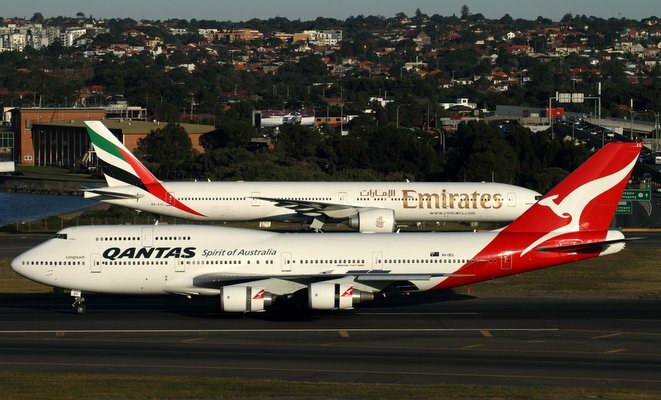 At the Dubai Airshow Qantas’s major alliance partner Emirates (one of those dastardly foreign government owned airlines) placed colossal orders for 150 Boeing 777Xs and 50 Airbus A380s. That presages yet more booming growth for Emirates. Fast-forward barely two weeks and Qantas is forecasting massive financial losses, 1,000 job cuts and another review of its capital spending. The relative decline of Qantas is becoming in starker and starker relief. With 1,000 further job cuts and “network optimisation and improved fleet utilisation” now planned, that relative decline – at least of the bits of the Qantas Group with a white kangaroo against a red background on its tail – is speeding up. Qantas hasn’t been specific about the route cuts and staff retrenchments, but clearly fewer staff will be needed to fly fewer aircraft to fewer destinations, a path Qantas has been travelling down for some years since the August 2011 restructure of the international operation was first announced. Since announcing a wholesale review of costs, capital expenditure and a new strategic direction for Qantas International in August 2011, the Group has made significant progress towards building a strong, viable business for the future. Transformation initiatives across the group have resulted in redundancies of approximately 3,000 full-time employees. Now this listing is likely primarily aimed at the financial community to show that Qantas has been taking robust action to shore up its financial position. But it speaks of decline as well. And that raises one big question. Who or what is to blame? An uneven playing field distorted by foreign government owned airlines and the majority foreign government owned Virgin? Or Qantas itself? And then there is the language used too. The announcement talks of the measures the ‘Group’ has made. But they almost entirely apply to Qantas mainline. That not so little low cost carrier subsidiary Jetstar seems to be doing ok for itself. How much longer are they going to keep that clown on the top job??? I have to aggree with Lucas………… A great Airline has been on the slide ever sinse they hired the wrong man! One has to wonder if the outcome would have differed if they had chosen the big twin all those years ago instead of sticking with quad-engined long haulers?? Didn’t turn out too bad for their major partner airline! I have a feeling some day in a memoir somewhere will be the words “If only we’d bought the 777”. hope the government gets rid of him as well as part of the deal. Enough said. They’ve had problems with their staff and unions with those strikes etc, they aren’t as fresh as Virgin, defintley hired the wrong CEO..
There’s only one man for the job to replace Alan Joyce: former Air New Zealand CEO Rob Fyfe. Air NZ, Emirates, Ethihad, Fiji, Singapore, etc etc are streets ahead. Which other airline has a fleet of 767s and old 774s and is screaming about efficiency. Ansett 2, correct! The cabin staff, FF staff and all the front line people are the very best. – maybe not the youngest or best looking but leave that to the Asians for what it’s worth. The previous CEO came from the construction industry and appeared to have no comprehension of relative aircraft values – the 777 non decision was critical. The delay in 787 deliveries meant they went to Jetstar and not mainline so, all in all, it’s been hard to get it turned around quickly enough. Apart from demanding resignations, no one has yet put forward a recovery strategy – anyone up for that? Sack the entire Qantas board, bring forward retirement of the +10 year old jets, bring forward the purchase of/order more new fuel efficient jets so that the fleet is being constantly renewed as is done my its major competitors, and expand it’s international network. What airline in their right mind would put state of the art 787s into its low cost fleet and leaves it’s full service fleet with old inefficient aircraft. Another issue is that Qantas is only a domestic airline in half the country and that shows up a massive loophole in the Qantas Sale Act. If Qantas keeps cutting its flights it will go under as it has substantial fixed costs regardless of the number of flights. It needs to expand its international network and aim for 30% market share and stop only focussing on keeping a 65% market share on the domestic front. Another option is for Qantas to concede the battle on the international front is lost, cease all international services and sell all its long-haul fleet. Correct. Air NZ does use 767’s – primarily to mid haul destinations. As a result they have had far fewer take offs and landings as they haven’t been smashed around doing MEL – SYD – BNE sectors like the very well used QF 767’s. To a passenger the Air NZ 767’s feel much newer. Of course, they weren’t due to be around any more at all, like many airlines Air NZ have kept them going because of delays to the 787-9. I am Gold Elite with Air NZ, and Platinum with both QF and VA and comment at length about the differences between the three airlines from a pax point of view. Out of interest, the Air NZ 767’s have refurbished cabins (like QF have done), but the Air NZ result is much better – other than J class which is about as good as JQ business class! That’s being sorted on the 787-9’s I notice. Qantas find themselves in a spiral. They are cutting costs. That either means only two things – reducing “unnecessary” costs/improving efficiency, and/or cutting service(s). To customers it appears to be simply services that are being pulled. The contraction on routes reduces the appeal (reduced services/frequency). As a result QF is less convenient for customers. And customers shop elsewhere. Often there is no real choice. The major areas of appeal to me with QF are frequency of service (especially domestically), price can be significantly cheaper than VA, the absolutely superb 1st class lounges (SYD/MEL) and business class lounges domestically. However, because they have reduced international services and changed the departure times for others, I find myself flying increasingly with Air NZ on trans-Tasman. Air NZ have a much happier situation for their employees (which is reflected in the service from front like staff) and an airline that is investing rather than cutting. VA likewise is investing and make no mistake, the airline investors in that business want a commercial return! QF must determine urgently and precisely how they exit the spiral they are in. You cannot “save” your way to a sustainable profit and a sustainable future. QF is increasingly shaping up as just a domestic airline. JQ will play a supporting role domestically as the LLC, while internationally EK does premium and JQ the low cost offer. I hope I am wrong but it’s an interesting point to debate. It is a realistic exit point from the spiral they have themselves in. I think the whole QANTAS saga is ridiculous in all honesty. In real terminology QANTAS is no longer the Australian National Carrier as it isn’t owned by the Australian Government. The Airline has to compete as a business on the international market with other carriers and in all fairness, the other airlines are a lot better. Thus why more and more people prefer to fly with other airlines. I personally am a fan of Emirates and Singapore Airlines, the service is good, the prices are reasonable, the frequent flyer systems are beneficial and they fly to pretty much every major location on the planet. This may not be to everyones taste but I think that they need to employ brand new, fresh, young people, as their cabin crew and make redundant the abundant amount of cabin crew who have been with the company for 30 years +. Singapore and Emirates have a crew rotation of about 4 years, they are all young, good for image and don’t require massive wages because they know that it isn’t a career. That is my five cents anyways. Maybe the sad reality is with Australian wages and employment law, no local company can operate a competitive International Airline. Air NZ is Govt owned, Virgin only virtual on International Services….why should Qantas be expected to be able to do any better, especially when loaded with all the excesses of previous Govt ownership. Harsh to blame the management when you consider the economics of all it’s competitors. I agree. Qantas need someone new to take over the top job. Qantas needs to concede to their endless strategy of having 65 per cent of local capacity is finished. With other international airlines having the benefit of significantly lower costs how can Qantas International compete with its staff and aircraft servicing predominantly based in one of the most expensive countries in the world. Ask the unions to concede their time is running short and to help by having all employment contracts rewritten similar to Jetstar and Virgin to reduce labour costs. The unions must get over it, either have jobs with reduced conditions or eventually there will be no jobs, a no brainer really! The other choice is for Qantas International to contract their staff and ancillary servies from cheaper overseas bases. Your call unions! Too many aircraft types in the fleet. Immediately offload the inefficient 767 and 747’s even if it reduces internal and external capacity. Qantas = cut back to save money until the economies of scale see QF so small it all has to fold like a deck of cards – whilst JQ has grown quietly in the background with overseas foreign investments into all the JQ ventures. I agree sack Alan Joyce and ask Air New Zealand to send over a manager. Air New Zealand are really good and have great managers and yes fly to some out of the way Pacfic islands and still manage to make some money. Qantas should have brought some 777 and with a small fleet of 747 800s bob your uncle. How much money does it cost QF to refurbish the ex-jetstar A330s? Should of put the 787 straight into QF mainline and retired 767s. How many people would of bought tickets just to experience the state of the art 787? Time to really focus on restoring pride in the QANTAS name! Why on earth would you operate an aircraft such as the 787 on hour long routes when it is designed to fly long haul to get the fuel saving benefits? As good as the 787 is, I never understood QF’s reason for purchasing them as 767 replacements. 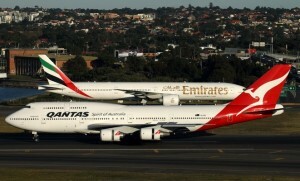 It’s another illogical decision by management that has run Qantas into the ground. Same as the A380. Why buy such a high capacity aircraft instead of going for a higher frequency of services with a smaller capacity aircraft? Something like the 777-200LR would be more suitable. Certainly Qantas should have taken the 787s, not for one hour domestic sectors, but to operate to Perth, were they would really offer some competiton to Virgin Australia on some of the most lucrative routes in Australia! If the 380 is such a dud, then why do two of the worlds most succesful airlines, Emirates and Singapore operate quite a large number of them? and Tim Clark from Emirates is so happy with them he bought another 50! True they also operate significant fleets of 777s, but they dont have domestic 1 hour sectors like Qantas, that require widebody aircraft, were the replacement choice is the 330 or 787. All you Qantas haters pretending to have some form of understanding about Qantas, their culture and their employees – step back for a moment. Qantas are a bloody fantastic airline, their staff are real and gritty, they are polished and proper. They don’t stand about in a cherry red dress chewing gum talking about their Saturday night plans smoking a cigarette in plain view of the public. They employee staff directly almost everywhere and do not use these joke outsourcing companies like Aerocare or Menzies. Their contact centres aren’t in Asia. Qantas means Australia to a lot of people worldwide and the brand should be protected at all costs. Sack the CEO you all reckon? How about you do his job for a day and come back to me, let me know how that went for you. They invest their money in their offerings and you are all forgetting how pioneering they’ve been in many many areas which airlines like EK or NZ have mimicked. How can Qantas fairly compete when they are paying their staff double what any EK or NZ employee would earn? We as Australian citizens are to blame for turning our backs on them. Bring Aussie jobs back to Australia and fly an Australian airline with real values. And no, I don’t work for Qantas. Given Alan Joyce’s complaints about level playing fields and unfair domestic competition could someone please ask him how long Qantas and Jetstar have been flying domestically in New Zealand. Specious arguments about separate corporate identities aside Qantas has been creaming off the lucrative maintrunk traffic in NZ while ignoring the less lucrative regional routes that AirNZ has to service. Perhaps the real problem is a culture of arrogance and superiority that emanates from both the management and staff which blinds them to the competition and the need for flexibility. Bleating now about foreign investment when they are operating overseas themselves is a bit rich. Soon only the rump of a once proud airline and a Kangaroo emblazoned ticketing agent for Emirates. Agree with Richard B, Qantas is by world standards a great Airline, and generally the service, particularly on Domestic flights is excellent. Equipment wise, 777 decision aside, again compared to the American carriers, Qantas has a relatively young and efficient fleet! The Domestic inflight product is with out doubt the best in the world, try flying an American domestic carrier! But the issue that Joyce raises re Virgin is valid, can anyone name another country in the world, were the Government will allow an Airline to run domestic services and be any more than 49% overseas owned? So Virgin Australia have acted within the law, and have been able to attract 3 major airlines as shareholders with deep pockets in the case of Etihad and Singapore, to enable Virgin to continue the domestic battle with Qantas. It is interesting to note, that the other Airline which is based in the same region as Qantas, and whom is subject to the same issues as Qantas, eg end of line position, no hub etc, namely Air New Zealand, seems to be getting on with the job, innovating and doing OK? There is no doubt that Air NZs management strategy and style, has delivered a much better result than Qantas! Unfortunately world geography is as much to blame as geo-politics & economic factors. The burgeoning development of carriers in Asia and the Middle-East is in many ways supported by serendipity of their geographic location – right in the middle of major air corridors that can allow for huge through traffic if you play your cards right, and can tap into lower cost labour. Unfortunately Australia is at the end of an air corridor and thus has a hopeless handicap. South Africa and South America are similarly constrained, unlike the far more populated geography of the Northern Hemisphere. I’m amazed however that in recent years Qantas hasn’t attempted to expand into lower volume routes using a suite of suitable aircraft like 777-200LR, A330LR, and 737-900ER. This move to a large number of “thin routes” could have generated significant new city pair combinations, rather than trying to push everything through hubs at either end. Why is it that the majority of new routes are being pioneered from outside Australia? Surely servicing Singapore, Kuala Lumpur, Hong Kong and Tokyo is in fact doing all the other regional cities with 1-2 million people a gross disservice, and ignoring a potential market if the right aircraft is used (like 737-900ER). Domestically they have done this for years. Places like Newcastle were screaming for jet services well into the 1990s, and rather than “creating the market” Qantas sat on the sideline for a long time. Further to my last, the 737-700ER would give Qantas a 9000km+ range with 2 class seating up to 130. This could open up many new city pairs, some a long way into Asia and the Middle East. The A330-200LR gives 12000km+ to 230 pax. Why not look to pursue hub busting long range lower volume services, and do them to a very high standard. This could take Qantas into the territory of market creation rather than just winding services back to the bare bones serving to bare minimum of extant major hubs. Sucess would obviously require spending and investment and working hard with tourism authorities to really advertise and create the service. – Also has the exact mirrored ‘jet connect’ set up in both Auckland and Chch operating services ex Australia to non NZ ports utilising 11 737-8s and 2 VH aircraft on a wet lease arrangement. And the pay difference goes beyond that of 50% (trust me on this one) Pot Kettle? – A great deal of all ports are out sourced ground handlers including all baggage handlers. I’m talking 95%. International and Domestic. Their service is a joke. – All VA Regional Airlines aren’t employed by Virgin incl Cabin Crew. – Virgins call centres are in Auckland, Manila and KL with a small group in Brisbane handling escalated calls. None of these employees are directly employed. You’ve mentioned above that these crew subsidiaries are paid between 30-40/50% less dependant. What are you basing your origins on? The old QFLH contract which expired nearly a decade ago?? This aside current contracts incl QCCA are still somewhat above their counterparts. Thinking business wise, I feel Qantas should concentrate on domestic operations (including N.Z.) utilizing local Crew, Handling, and Maintenance and continue doing what they do well. I find it a little tiresome reading throwaway lines about greedy unions being the reason companies run by ordinary management struggle. Sure, wage costs need to be tightly controlled. But if you can’t make money paying your workers a fair wage and you can’t do the job yourself, then you don’t have a very good business model. Why does Qantas fly 2 A380s and 2 B747s daily between BNE,SYD,MEL and LAX, and have 3 of them land on top of each other at 0630 and the 4th just three hours later, then have all 4 depart within an hour in the evening? To compound matters it’s the 0630 SYD/LAX flight that continues to NY, so if you are flying from MEL to JFK, you are expected to do a quick plane change in LAX. Why not stagger them and give customers a choice what time they want to arrive in LAX? Also, if Qantas cannot compete on cost with Asian carriers, why try to compete on the exact same routes as them? With an A380 or a B787 you should almost be able to fuel up in Darwin and then non-stop to London. Why not fly an A380 from SYD/DRW/LHR and top it up with connecting domestic services from all other capitals to Darwin? I don’t know. Sack the management? Sack the Staff? Qantas just needs to start thinking innovatively, and giving people a service they are prepared to pay a fair price for.